England and the Dutch Republic fought three naval wars in the middle of the 17th century, arising principally from a clash of mercantile interests. In the first of these, under the Commonwealth, England had much the better, due largely to the outstanding leadership of Robert Blake. The second war was more even. By now Charles II had been restored to the throne. There were a number of fierce battles which went either way, but the war ended with the humiliation of the Dutch burning a large part of the English fleet in the Medway. After reviewing the earlier wars, this book goes on to describe the third Anglo Dutch war, fought between 1672 and 1674. This war of shameless aggression was provoked by England, or rather by King Charles and his court, mainly as a matter of commercial greed. It began, before any declaration of war, with an attack on a Dutch merchant convoy proceeding up-Channel. In this war, for the first time, England fought in alliance with France, and the French fleet was an important, if ultimately ineffective, part of the fleet which under the leadership first of the Earl of Sandwich, then by James, Duke of York, and finally by Prince Rupert, took on the Dutch fleet led by the brilliant Admiral Michiel de Ruyter. At Solebay on the Suffolk coast, de Ruyter surprised the English fleet on the morning of 28 May 1672; in the intense fighting Sandwich’s flagship, the Royal James was blown up and he was killed. Overall, the Dutch could claim it as a victory. 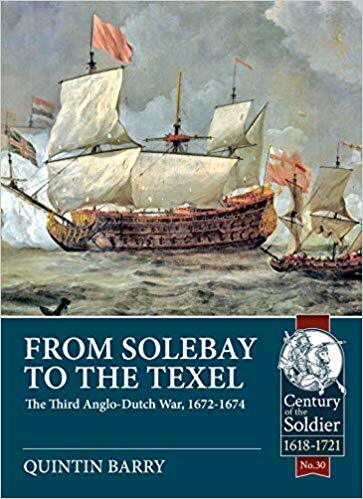 There later followed in 1673 two battles off Schooneveld and then the battle of the Texel. In this fight the French treacherously hung back. De Ruyter’s tactical skill in these battles ensured that a planned attempt at invasion was prevented. The war ended with the Allies by no means in unison, and Charles II, obliged by lack of funds to make peace, had nothing to show for a war that should never have been fought.